Microboards’ award-winning Disc Publishers are available in a custom configuration that integrates a special recorder approved by the ISO-certified archival process. 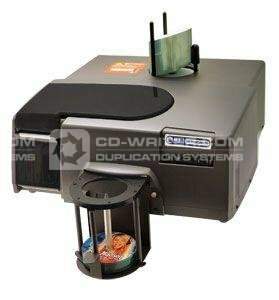 Combined with ISO-Archival Media from JVC, applications with critical, long-life data requirements can automatically print (label) and record a disc that is certified for 30+ years of data integrity! Archival Publishers work with both specialized ISO-certified archival discs from JVC, and with standard media. Your favorite Microboards publishers--the G3, CX-1, and MX Series--are now available in ISO Archival modes! UK's Lowest Price. Microboards are proud to announce the launch of their all- new" MX Print & Burn series printer/publishers. The MX Series was designed specifically for organisations that need to produce anywhere from one to thousands of discs! Designed for industrial environments, the MX-1 comes with one high-speed DVD/CD recorders, and the industry's fastest, lowest cost-per-disc inkjet printer, all integrated into a robust publishing solution. Also available is the Autoprinter only version, the PF-Pro. All three feature 100 disc input and output capacity, Microboards' enhanced automation for reliable loading and unloading of discs and professional software. By utilizing the latest in HP inkjet technology, the print speed and quality of the MX Series of Disc Publishers and Printers is unequaled among disc duplicators. Separate Cyan, Magenta, Yellow, and Black ink cartridges mean zero waste and the lowest possible cost-per-disc. One set of ink cartridges can produce over 1,000 discs and discs designs utilising light text-only coverage could have throughput at upwards of 250 discs per hour. Combined with 18X DVD/48X CD recording speed in a single recorder or dual recorders, the MX Series is the best solution for high-volume disc publishing." Microboards . MX1 . Archive . ISO . Disc . Publisher .